The researchers incorporated an enzyme that can break down cocaine into a mouse's stem cells, then transplanted these cells back into the mouse to act as a depot for the long-term release of the enzyme into the bloodstream. They say the mice with these skin transplants were less likely to seek out cocaine or die of an overdose. Drug abuse, particularly of cocaine, is associated with compulsive drug-seeking and frequent relapsing despite long periods of abstention. Effective strategies to treat emergencies arising from cocaine overdose are needed, and behavioural and pharmacological treatment strategies developed to date have had limited success. Treatment with intramuscular injections of butyrylcholinesterase (BChE) — an enzyme optimised to degrade cocaine — has limited efficacy in animal models, in part owing to its short half-life. In a new study, researchers at the University of Chicago in the US have found that mouse skin stem cells genetically modified to produce BChE can be transplanted back under the skin of the same mouse to act as a depot for the long-term release of the enzyme into the bloodstream. 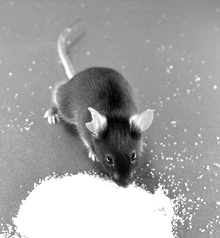 This treatment reduced cocaine-seeking behaviour during conditioned place preference tests and prevented the death of mice exposed to lethal doses of cocaine. Further research is needed to determine whether these findings can be translated to the clinic, but this approach may pave the way toward a new class of therapeutics for the long-term management of drug abuse.